And that definitely includes looking for vintage airplanes... no matter where we are! This permanent exhibition about the history of flight includes a Junkers F-13, the first airplane in the world with metal frame-work. That was the signature antique airplane that really sent us looking for the museum. ...that sort of seemed logical. 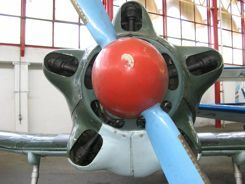 The Aviation Museum IS part of the Kozlekedsi Transportation Museum, but it's located in a separate building, Petofi Csarnok (Petofi Hall), a couple of hundred yards into the Varosliget Park where the Transportation Museum is located. We wanted to make sure we were in the right spot before we paid the entrance fee... we couldn't see where there were any planes in the museum. So we asked where the planes were, and the little lady at the ticket booth told us.... in Hungarian. It took a bit of sign language, but finally she took us out the door and pointed us in the right direction. The building is not in an obvious location for an aviation museum, so just keep asking and looking. Everyone is friendly and helpful. Mark loves to see all types of historical aircraft, and he couldn't pass up a chance to see some planes that you just can't see at home. 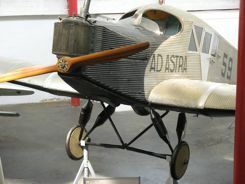 The Budapest Aviation Museum displays a lot of both Hungarian and foreign aircraft... from antique airplanes to gliders and helicopters... along with a display of engines and other aviation related equipment. There are mostly civilian planes on display, though you will see a Yak-18 and the space capsule of the first Hungarian cosmonaut. 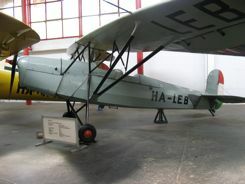 Other planes of note are the Hansa-Brandenburg B.1. And it was one of the earliest designs of Ernst Heinkel of World War II fame. 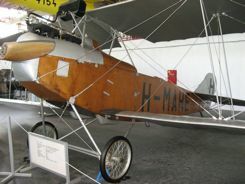 Another World War I vintage airplane is a Hungarian Lloyd Prototype 40.01 (1914). 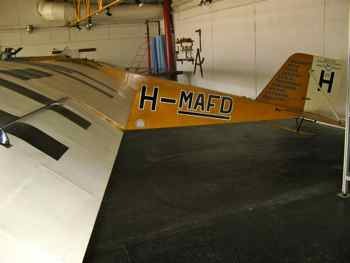 This clumsy looking biplane set altitude records on her first day of flight... 4,120 meters with two passengers. We're talking 4,120 meters here (13,517 feet)! And it reached 6,170 M (20,243) just a few days later. I don't know about you, but I find that impressive for 1914! A Repulogepgyar Levente II (1942-43) on display was a Hungarian two seat trainer and liaison aircraft from World War II. 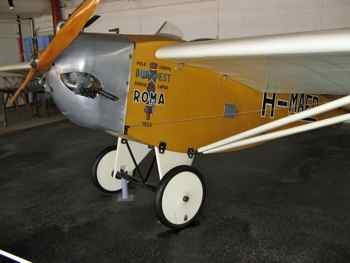 Another antique airplane is the Hungarian Lampich L-2 "Roma". This little single seat light monoplane set all kinds of world records in the 1920s... if you count flying 635 miles (1022 km) in 16 hours a world record! 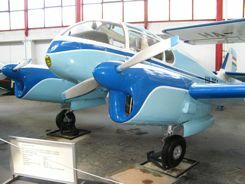 One other fun vintage airplane that you don't see too often is a Super-Aero 45... a fun little twin engine airplane built in the Czech Republic (when it was still part of Czechoslovakia) in the Let factory in the 1950s and 1960s. It's the second oldest underground Metro system in the world, built between 1894 and 1896. The original purpose of this first metro line was to carry passengers from town to the Budapest City Park. How lucky for us! That Metro Line 1 was itself declared a World Heritage Site in 2002! The station in town is reminiscent of the 1890s... including the floor, the benches, the lighting and wooden window frames in the station... and old pictures. A great way to start a journey to the Budapest Aviation Museum and the Transportation Museum. In addition to the Transport Museum and the Aviation Museum, the Szechenyi Medicinal Baths are located in Varosliget Park... as well as the Millennium Monument, a couple of other museums, and the zoo. 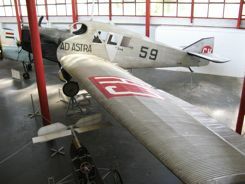 The Budapest Aviation Museum is open Tuesday - Friday 1000-1700, Saturday and Sunday 1000-1800. Hours are shorter during the winter. The museums are closed on Mondays. The Budapest Aviation Museum is a nice little museum to visit. If you have family members who say they don't want to go running off just to see antique airplanes, tell them that the City Park itself is worth a visit to see the Szechenyi Baths. If you're lucky, as we were, you might even find a festival going on... you never know what you'll run into when you get a little off the beaten track looking for antique airplanes! 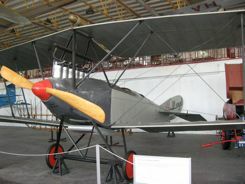 Tell us about YOUR Favorite antique airplane or museum or airshow!